All materials on www.JK7SkinCare.com, and all affiliated websites of JK7 SPA & WELLNESS LLC, are protected by copyrights, trademarks and/or other intellectual property rights. These materials are owned by JK7 SPA & WELLNESS LLC or its subsidiaries or affiliates, or used with permission of their owners. Such materials include, but are not limited to, the photographs, images, illustrations, text, video clips, audio clips, products, books, logos, trademarks, and other materials contained in www.JK7SkinCare.com, as well as the software used in the design and development of www.JK7SkinCare.com. All rights are reserved, worldwide. The name and mark and the logos of JK7® Luxurious Natural Skin Care, the colors used for the design, packages, and all other JK7 SPA & WELLNESS LLC related marks depicted in www.JK7SkinCare.com, whether registered or unregistered, are trademarks or service marks of JK7 SPA & WELLNESS LLC in the United States and worldwide. The materials contained in www.JK7SkinCare.com are displayed for informational and promotional purposes only. JK7SkinCare.com is solely for private, personal, and non-commercial use. 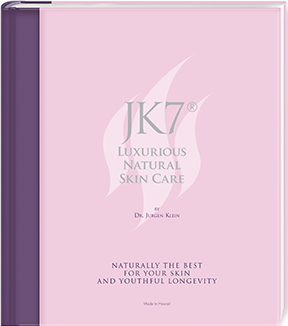 You may download or copy materials in www.JK7SkinCare.com solely for your personal non-commercial use. You do not obtain any right, title or interest in any material or software as a result of any such downloading or copying. You may not reproduce (except for your personal non-commercial use), publish, transmit, distribute, display, remove, delete, add to, otherwise modify, create derivative works from, sell or participate in any sale of, www.JK7SkinCare.com, any of the materials of www.JK7SkinCare.com, or any related software. Any other use of materials on www.JK7SkinCare.com, including reproduction for purposes other than your personal non-commercial use, modification, distribution or republication, without the prior express written permission of JK7 SPA & WELLNESS LLC, is strictly prohibited. Use of the websites is subject to these legally binding Terms and constitutes your agreement to be bound by and to act in accordance with these Terms. We reserve the rights to change these Terms at any time by posting changes on the websites. Any changes are effective immediately upon posting. The continued use of the websites constitutes your agreement to any revised Terms. Use of and browsing in the Sites are at your own risk. Neither JK7 SPA & WELLNESS LLC nor any party representing or otherwise affiliated with JK7 SPA & WELLNESS LLC in creating or presenting the websites are liable for any direct, indirect, special, punitive, incidental, exemplary or consequential damages arising out of your use of the websites. To the extent permitted by law and without limiting any of the foregoing, everything on the websites is provided to you on “as is” basis, without warranty, either express or implied, of any kind, including, but not limited to, the implied warranties of merchantability, fitness for a specific purpose, freedom from computer virus, or non-infringement. Because some jurisdictions do not allow limitations on implied warranties, or limitation of liability for consequential or incidental damages, the above limitations may not apply to you. Please check your local laws. JK7 SPA & WELLNESS LLC is not responsible for third party websites that link to or from the websites. JK7 SPA & WELLNESS LLC does not endorse any such websites or the goods or services offered on such websites. JK7 SPA & WELLNESS LLC disclaims all responsibility for the accuracy of any of the information provided on such linked websites and any goods or services provided or purchased from such websites. JK7 SPA & WELLNESS LLC shall not be held liable or responsible for the content of any websites that link to or from the websites. JK7 SPA & WELLNESS LLC takes reasonable steps to ensure the accuracy of the information included in the company websites. However, JK7 SPA & WELLNESS LLC takes no responsibility for errors or omissions in the content of the websites and does not guarantee the accuracy, completeness or timeliness of information provided on the websites. Information provided on the websites is subject to change at any time without prior notice. The failure on the part of JK7 SPA & WELLNESS LLC to enforce any part of these Terms shall not constitute a waiver of any of JK7 SPA & WELLNESS LLC rights hereunder for past or future actions. Any dispute over the content or use of the websites, shall be governed by the substantive laws of the United States, and the jurisdiction and venue of any such action shall be vested solely in the federal courts of Honolulu, Hawaii. JK7 SPA & WELLNESS LLC may change these Terms at any time by posting changes on the websites. Any changes are effective immediately upon posting. The continued use of the websites constitutes your agreement to any revised Terms. The websites are not intended to provide any medical information about the skin or otherwise. The laws of the United States shall apply to the collection of Personal Information as defined below. The laws of the United States and other countries to which we may transfer your personal information may not provide a level of protection equivalent to the laws in your home country, if you are accessing websites intended for United States consumers from outside the United States. The data provided by you (name, title, date of birth, telephone number, e-mail address, postal address) and the data about your JK7® purchases or JK7® stays will be stored to the required extent and for the duration of the business relationship and used for sending information and advertising about JK7® products by e-mail and post, sending an electronic newsletter, information about the availability of ordered cosmetic products and inquiries about stays in the JK7® Retreats by telephone and e-mail. In the event of a transfer of management, you agree to the co-transfer of the above data and the transfer of responsibility to the new business owner. You can revoke your approval at any time by letter to JK7 SPA & WELLNESS LLC, 59-338 Wilinau Rd. Haleiwa, Hawaii 96712, USA, Phone Number +1 808 638 7020. From the time the revocation is received by the company, no further data processing will be carried out on the basis of this declaration of consent. The legality of the processing of personal data remains unaffected until the revocation is received. The right to information, correction, cancellation, restriction of processing, data transmission and complaints can be asserted by you at any time to the data protection authority. Our website uses social media plugins from Facebook to personalize their use. Therefore we use the “LIKE” or “SHARING”-button. This is an offer from Facebook. Each time you access a page of our website that contains such a plugin, your browser establishes a direct connection to the Facebook servers. The content of the plugin is transmitted directly from Facebook to your browser and integrated into the website. By integrating the plugins, Facebook receives the information that your browser has called up the corresponding page of our website, even if you do not have a Facebook account or are not currently logged on to Facebook. This information (including your IP address) is transmitted directly from your browser to a Facebook server in the USA and stored there. If you are logged in to Facebook, Facebook can directly associate your visit to our website with your Facebook account. If you interact with the plugins, for example by pressing the “LIKE” or “SHARING” button, the corresponding information is also transmitted directly to a Facebook server and stored there. The information is also published on Facebook and displayed to your Facebook friends. BY USING THE WEBSITES, YOU SIGNIFY YOUR UNDERSTANDING AND AGREEMENT TO COMPLY WITH THE TERMS & CONDITIONS OF USE.